The 2nd Annual North Bay Rotaract 5K Fun Run will be located at Perigot Park in Blue Lake on June 11th, 2016. The race will begin at 10:00 am leaving and finishing at Perigot Park with the route going through town, the business loop, and along Hatchery Road. The event will end at 3:00 pm and will include color throwing stations along the route along with various fun activities being held at the park along with music by Iron Fyah Sound, BBQ'd Food, face painting, corn hole, and a Dutch Raffle. A portion of the proceeds will be benefiting local non-profits including Food for People, CASA, Boys & Girls Club, and Special Olympics. You will have the choice to "run for a cause" for one OR all of the four non-profits and support them in wearing their color (color choices shown during tickets sales). 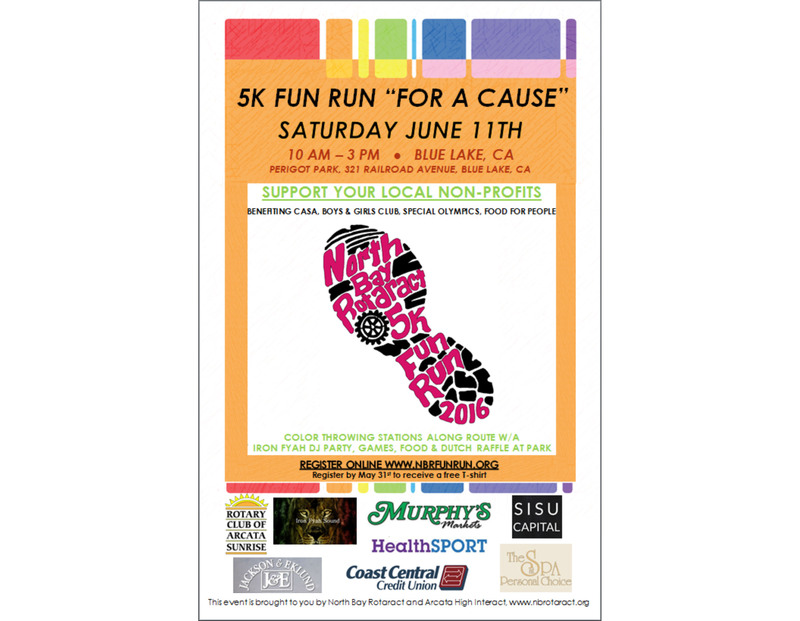 Choose Food for People as your charity of choice for this 5K Fun Run and get out there and have some fun! The event is brought to you by North Bay Rotaract and Arcata High Interact.Check out the Fun Run website www.nbrfunrun.org for more information or email nbrotaract@gmail.com.